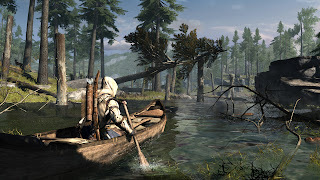 As the third instalment in the series, Assassin’s Creed 3 has many expectations upon its shoulders including but not limited to progressing the story line whilst catering to the fans, expanding the gameplay without hindering the core concept and last but not least justifying its price tag. As Ubisoft has been on a role of late with great game releases such as the Rayman franchise, Far Cry 3, Just Dance and ZombiU the spotlight is now distributed among more games than usual, which means that Assassin’s Creed has its work cut out for it in order to establish itself as the leader of the pack. The Assassin's Creed storyline should be easy to follow if you've come across any of the previous instalments. You play as an Assassin, or rather the descendant of one in the present, known as Desmond Miles. As Desmond is a descendant of the Assassins, a company known as Abstergo recruit him in order to test the device known as the Animus. The Animus dives deep into the subjects DNA and allows them to re-live the memories of their ancestors at any point in time. It is established early on in the plot that an individual’s DNA can contain memories of their ancestors and as Desmond’s ancestral heritage is that of an Assassin he proves to be of great interest to the antagonist's, the Templars. The Templars and the Assassin's have been at war since the beginning thanks to conflicting goals and Desmond becomes aware of a conspiracy that he turns out to be a great part in. The events lead him to an underground cave which houses a gate that needs to be opened in order for him to complete his final goal however the keys are missing and he plugs into the animus once more in order to locate them. Apparently assassin's love hide and seek, as Connor seems to be playing here. The story starts off in the present time with Desmond and his clique addressing the problems they are currently in. Soon we are re-introduced to the Animus and the real game begins but suddenly takes a sharp twist which certainly isn't worth spoiling, unfortunately there isn't much more to be said regarding the story without spoiling a lot however it does tend to drag on a little. It’s broken down into 12 sequences of varying length depending on the type of missions and usually between loading times I often found myself forgetting the current goal. 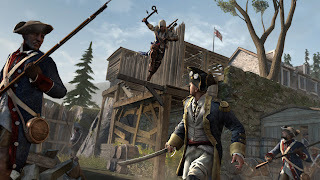 We see appearances of famous folk such as George Washington and Ben Franklin and the story intertwines real history with Assassin’s Creed fiction often making it hard to distinguish between the two which greatly adds to its believability. For those of you who have not played an Assassin's Creed game; at its core, it’s a third person adventure game with a strong narrative. The objectives are your usual point A to B affair with some inclusion of variation in order to break the pace. The best thing about the Assassin's Creed franchise, (in my opinion) free running, still plays a central role in traversing the environment but this time around the environments are better organized and you will usually find paths across rooftops a lot easier and more convenient to navigate. Travelling on foot however is a lot easier now and climbing, shimmying, balancing and jumping feel a lot faster and transition well into each other. The combat is handled mainly through melee weapons such as swords or mechanical wrist blades that can be cycled through with the d-pad. There are also options to upgrade your arsenal as you progress. Another interesting feature is support that you unlock later on in the game. This allows you to get a team mate to perform actions that can benefit your cause such as distracting guards by starting riots etc. The gameplay is your usual Assassin’s Creed affair, a huge environment this time around with a great wilderness to explore to your heart’s content and more stuff to do than you can shake your hidden Assassin’s blade at. You also get guns but ammo is limited and using them is painfully slow. The gameplay also includes a variety of missions on a ship so expect a large range of pacing. Each mission has optional goals and achieving all of them allows you to be in 100% sync with the memory in question they can vary from not being throughout a certain sequence to not killing any guards and though you are mostly able to approach objectives anyway you see fit achieving these optional objectives incites a more skilled and stealthy approach creating a good balance between doing what you like or following the assassin's code. There are also numerous mini games that you can participate in between missions and hunting wild animals is also possible in the wilderness. Thankfully the game does not suffer from repetitive gameplay and the environment is so vast that it becomes hard to memorize places until you are well into the game and have spent a few hours travelling around. At this point things begin to go downhill as travelling becomes very tiresome, very quickly, even with the magic (not really) horse you can summon at any time and he/she appears no matter where you may be in the wilderness. There is a fast travel option but loading times are so long that it would probably be easier to walk, not to mention that fast travelling only takes you to the gateway of the place you want to enter so another loading screen awaits almost instantly. One good point about the travelling aspect is how the season or weather can affect you for example, during the winter; you’ll find yourself slowly wading through the deep snow as you attempt to reach your next destination. The weapons this time around are also slightly different to previous Assassin's Creed games, though the hidden blade remains the sword has been replaced with a tomahawk and there are also many welcome new additions such as poison darts, the full arsenal can be accessed with the trigger buttons but these items are only available to the protagonist during the flashback sequences. It seems that nearly all previously single player games are starting to offer Multiplayer and Assassin’s Creed 3 is certainly no different. The game includes a vast Multiplayer that incorporates assassination although slightly differently from its single player counterpart. Instead of playing as the protagonist, you can play as a chosen character out of a list of 20 or so. The characters have their own unique back stories and in no way are affiliated with the story. Multiplayer is split into two types, Wolfpack which allows you to co-operate with up to 4 players and attempt to achieve objectives together and standard Multiplayer where you play against other players competitively. The competitive Multiplayer works well; you can be the pursuer as well as the pursued and your objective is to eliminate a target that you are given by random. At the same time, someone may also be hunting you, so you have to blend in with the crowd of AI that is scattered throughout the map in order to kill your target without rousing suspicion on yourself. The Multiplayer guides you through a couple of non-compulsory tutorial sessions when you begin and then allows you to join a public match. There is a levelling system as well as various perks and abilities available to you but don’t expect the whole equipment kit that you wore with Connor. There is also basic customization on the characters that are provided, you can outfit them with your own coat of arms as well as change their clothes as you unlock them. The visuals are where Assassin's Creed 3 comes into its own, and although that phrase is usually linked to a positive outlook, AC3 unfortunately does not quite meet expectations as a Triple A title. Most of the problems come with glitches that are appalling to behold and certainly missing from its prequels. There are screen tears everywhere; many textures are slow to load almost as if you are exploring the game world faster than it can keep up with you. To be fair it is rather a large game with a vast environment to explore but as there are many loading times in between, you would have hoped that they could have somehow avoided the many screen tears that come along the way. Towns and cities look like they have been carefully crafted with the time and places in mind; although their layout may or may not be historically accurate, it certainly brings the environment to life. Row row row your boat, gently down the stream. The music is also relevant to the setting but it fails to set the pace and often the ambient sounds are brought into the foreground, while the dialogue and voice acting is of good quality the characters often do little to make them memorable. So does all the negativity weigh down AC3… well yes, it fails to meet expectations as the sequel we were all looking for, though the glitches don’t help it’s the narrative that ultimately leaves you wanting more from the story and as its the narrative that fans are closely following, it leaves us with a sour taste in the mouth. The gameplay however is not lacking and has plenty of things to do even when the story is long completed you will be spending a long time tracking down almanac pages, hunting down the rare beasts and assassinating people online which actually proves to be fun and entertaining. Well mon ami, that is a pretty decent review you have there for one of the best games of the series. I really loved it and Connor handled just simply marvelously! Still pretty sad they sort of ended the story with Desmond so quick, but they can always resume or take up another one, right? may i use your assassins creed 3 image for a school project?